Mary Hysong was born and raised in Miami, Arizona. She has been drawing and painting for as long as she can remember. While in other places you would plant potatoes as early as February or March, here in the desert foothills, June is a good month to start. This is because if you start them too early, by the time the summer heat arrives in mid-June the plants will often just shrivel up and die, making few if any potatoes. While I do start a few spuds earlier in the spring, I start them with the idea of just eating little new potatoes and not planning on any 'keepers'. 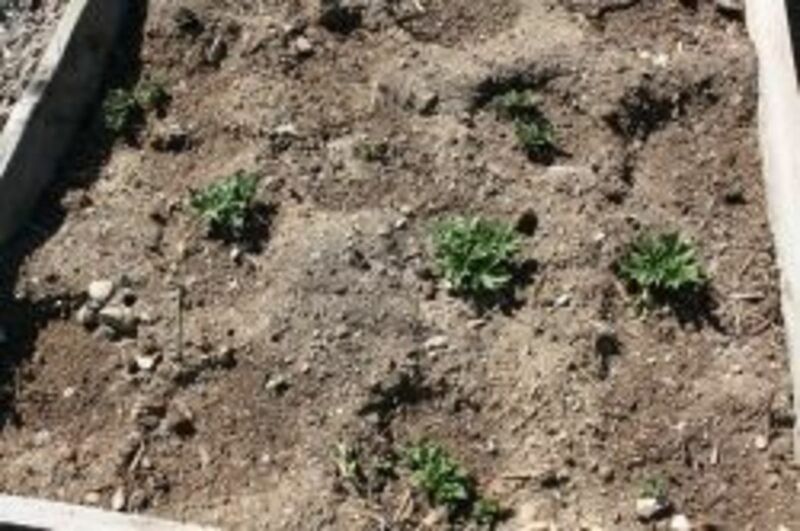 By starting my potatoes in June, however, the plants will jump right out of the warm soil and bush out quickly to shade the ground around them, keeping it cooler. Then they will begin to mature nice potatoes as summer winds down and the weather cools off around the end of September, early October. Most years this also coincides with a dry spell which helps limit the spread of fungal diseases and helps the mature tubers ripen for better keeping. I live at 3500 feet in the desert foothills of Arizona. If you live in a different climate you will want to check with your local agriculture office or experienced gardeners as to the best time for planting potatoes in your area. While most people think of potatoes as 'roots' and they are indeed often lumped in with 'root crops' because they grow underground like roots, they are not roots. Potatoes are actually 'tubers'. A tuber is a thickened plant stem growing underground. It's thickened because the plant has been storing food there. Also, tubers have buds (called 'eyes') from which new stems can grow. This means that you can take a tuber away from the parent plant (and in the case of the potato, even just a piece of a tuber) and plant it and it will grow into a completely new plant. While potato plants do have some pretty flowers and they do make little seeds, sometimes called 'true seed', those seeds do not usually produce very large or robust plants. Enter in 'seed potatoes'. These are potatoes that are sold especially to be cut into pieces and planted. Now, all those experts that write gardening books will tell you to only buy seed potatoes that are certified to be disease free. This can be very important, especially in humid, rainy climates which are conducive conditions to several diseases that will wipe out your potato patch. These diseases can spread to other plants and they can live on in the soil for a number of years. These diseases are the various blights and wilts, usually caused by fungi in the Fusarium and Verticillium families. I am a bit blasé about the whole thing and I do go against this good advice and just plant any ol' potato that sprouts in the kitchen. I suppose some day I will be sorry but so far it's working for me. 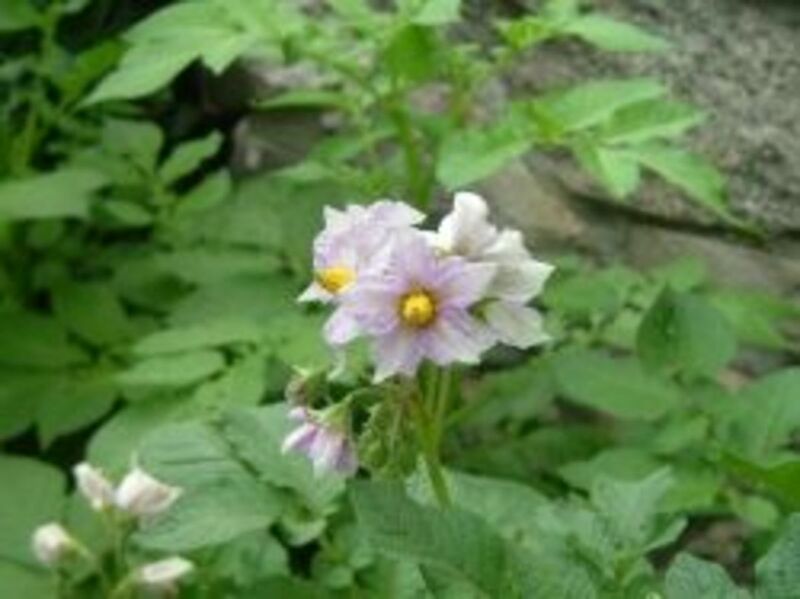 Potatoes are in the Nightshade family and are related to tomatoes, peppers and eggplants along with quite a few weeds. This means that you shouldn't plant potatoes where one of these crops grew the past couple of years and any blight or wilt that affects one could spread to the others. Potatoes do not need an overly rich soil, but it should be very loose, high in organic matter and fairly free of sticks and stones. 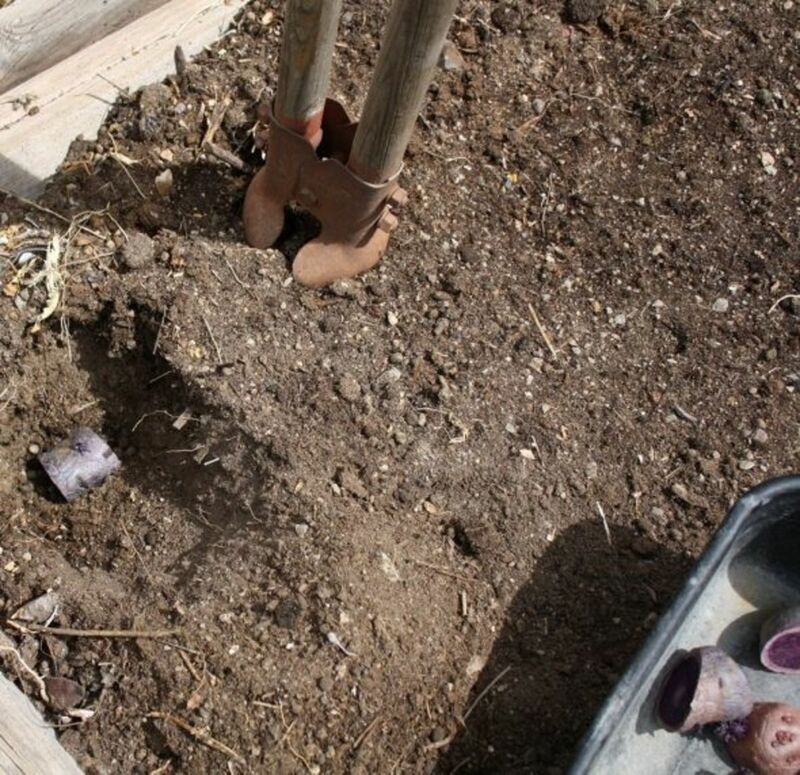 Do not apply fresh manure to the soil for several months prior to planting potatoes. Thoroughly composted manure, that has matured at least 6 months prior to application is alright. The reason is potatoes do not require large amounts of nitrogen, which is found in fresh manure. 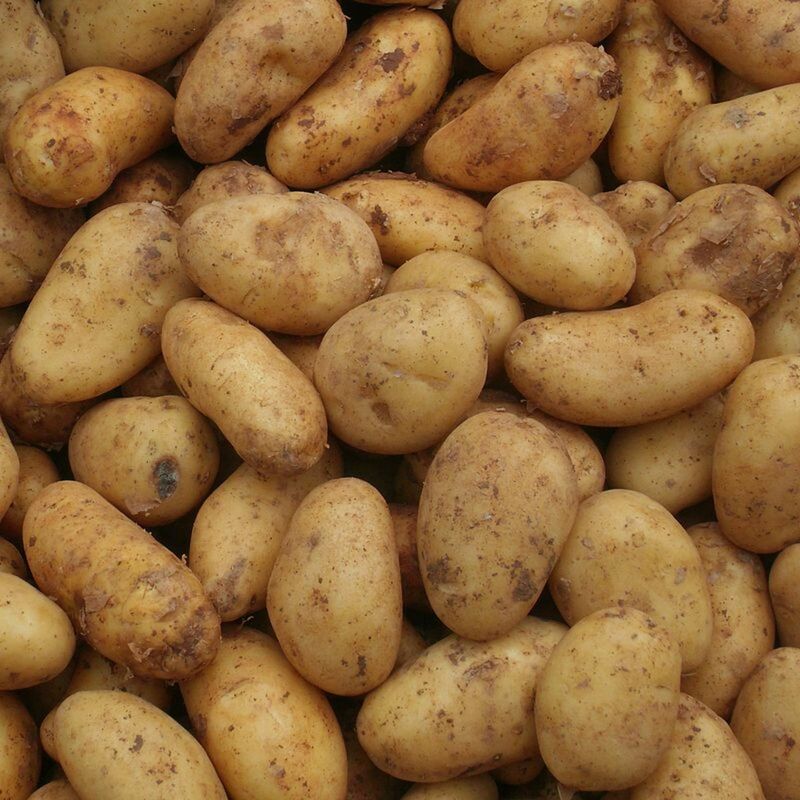 Using manure on the soil too close to planting potatoes will give you big green plants that fall over easily and that produce mostly small skinny spuds. Loose soil free of lumps and rocks is important so that the little potatoes can expand without much resistance. All of my older garden beds have been dug down to a depth of 18-24 inches. At times this has meant using a pickaxe and a pry bar to remove large rocks from the area. My beds are 36-48 inches across with narrow paths between. I never step into the bed once it has been dug. This keeps the soil quite loose so that in future seasons I only have to loosen the top few inches with my spading fork. On my own soil I keep up a huge composting operation recycling all the organic matter I can get my hands on. I use compost from piles that finished heating up at least 6-9 months ago. My own soil is very high in phosphorus, so I don't need to add any. While my soil tests show zero to low amounts of nitrogen my potato crops have grown just fine without any additions other than compost which includes a fair amount of manure. I do buy and use a variety of different organic potassium fertilizers. Some contain sulfur and magnesium, others contain zinc. I usually buy a different one each year, to avoid too much build up of these other minerals. You should of course have your own soil tested and follow the recommendations given. Be sure when you send off your soil sample to specify you want recommendations for an organic garden if that is important to you. Otherwise you will get standard chemical fertilizer information. So, prior to planting my potatoes, I spread 3-6 inches of well cured compost over the bed, along with a sprinkling of potash and fork it in. If the soil is dry I will water it well then let it sit a day or so before raking it level and planting. I have to mention here that the pH of your soil should be on the acid side for potatoes. This is very difficult in desert soils where the typical pH is 9 or higher (7 is neutral, above 7 is alkaline and below 7 is acid). I've written a simple article about pH here. Lots of compost and mixing in peat moss are two things you can do to help lower the pH of your soil. Sulfur or gypsum are used on some soils to lower pH also. Soil for potatoes should be about 5-6 pH. If the soil pH is much higher than that it can foster a disease called scab. 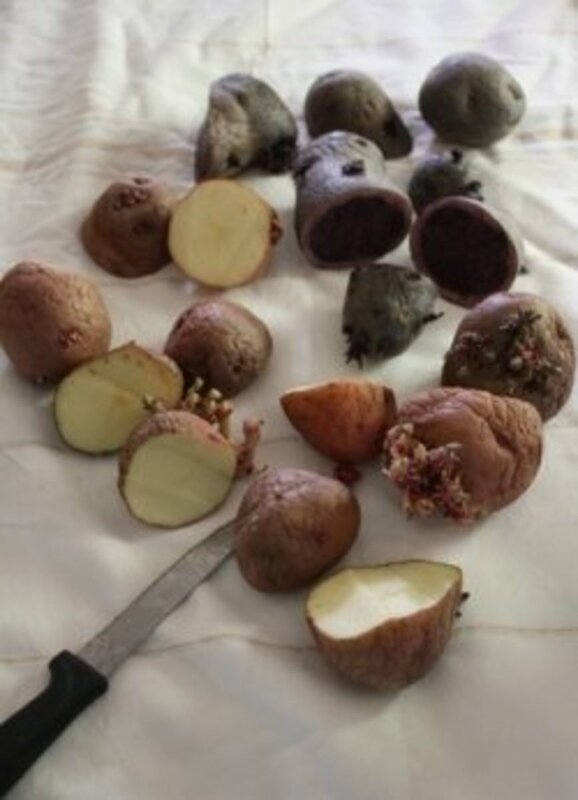 While scab makes the potatoes ugly, they are still edible, you just cut the lesions off. If you have gardened in an area where the soil is acid and you are used to adding lime or wood ashes to your soil, you should never do that here in the desert. The soil is already extremely alkaline. While wood ashes are a good source of potash, which some of our desert soils need, it will raise the pH even higher and should never be used here. Don't Have Space for Potatoes? Even if you don't have a lot of garden space or if the soil you have isn't suitable for potatoes you can still grow them by using pots or grow bags like these. Grow bags are very popular in many places, especially in Europe. If you are going to order some certified seed potatoes, do it well ahead of planting time. Keep them in a warmish spot (but not too warm!) so they will begin to sprout. Ideal seed potatoes are on the small side, about 2 ounces. If they are large, then they should be cut into pieces, with one or two eyes on each piece. Leave the cut pieces exposed to the air for a couple of days before planting, so the cut will callous over and be less likely to rot if the soil is on the cool side. 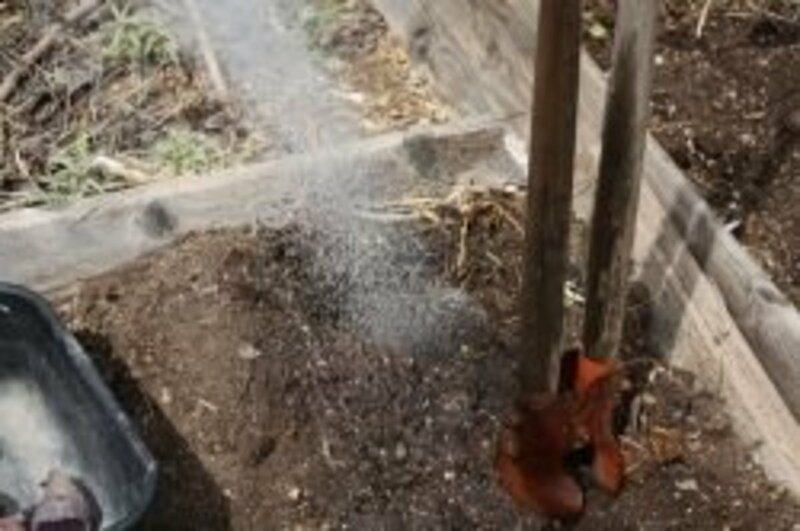 People who live in rainy areas often propose novel ways of growing potatoes, such as setting the seed pieces on top of the ground and covering them with a mulch like straw or leaves. Here in the desert these ways do not work very well. It is impossible to keep them damp enough for the plants to grow well. My favorite style of garden bed here in the desert is actually sunken a bit below the level of the adjacent path. This is to direct all water into the bed. I do currently have some raised beds that are surrounded by wood borders. I am a bit up in the air on these; while harder to keep them watered in the summer, the wooden borders are handy to hold frost and bird protection devices as well as trellises. But I have some more ideas about these and expect that my really deep wooden borders will eventually be removed in favor of sinking the beds below path level. So onto planting. Because most potato varieties make their new potatoes above the seed piece you planted, you want to plant them pretty deep, at least 6-9 inches. If your soil is very loose and sandy you could go even deeper. If your soil is a heavy clay, go a little shallower. I use my post hole digger to make my holes. Here you can see that I have used my post hole digger to make a hole and have dropped in a piece of purple potato. 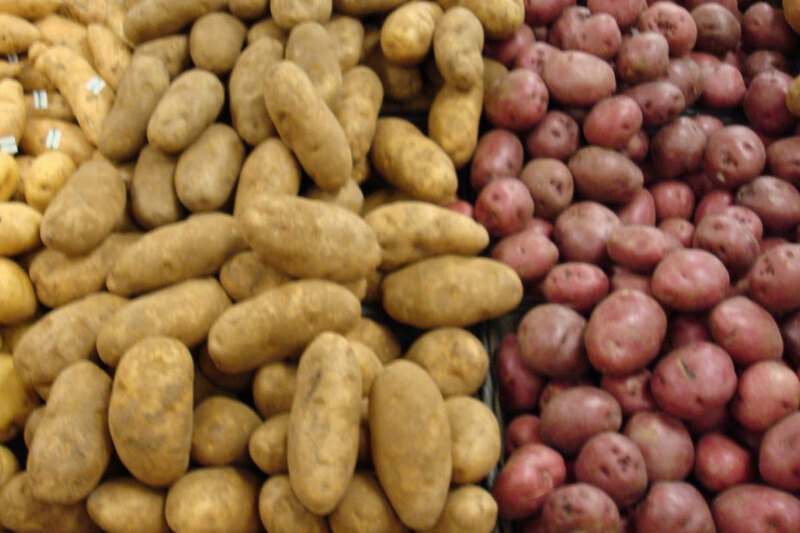 (Did I mention potatoes come in a lot of different colors, sizes and types?) The digger is setting where I will make the next hole and some of that dirt will be used to cover the first piece planted. I use wide beds throughout my garden instead of planting in rows. There are many advantages to this method which I will not get into right now. In my beds I plant on a roughly hexagon pattern, like a row of 4 then a row of 3 then a row of 4 again. I plant the potatoes about 9-12 inches apart in each direction. The ground was pretty dry when I was planting this year, so I filled each hole with water after I set in the potato, before I covered it with soil. I only fill the planting hole part way with soil because I want a depression that will catch and hold the water and direct it right to the potato roots. Here is the finished bed. Now I will water into the depressions every few days and wait for the potatoes to sprout. Ten days later the potatoes are sprouting. Once they are all up and growing strong I will apply a thick mulch. 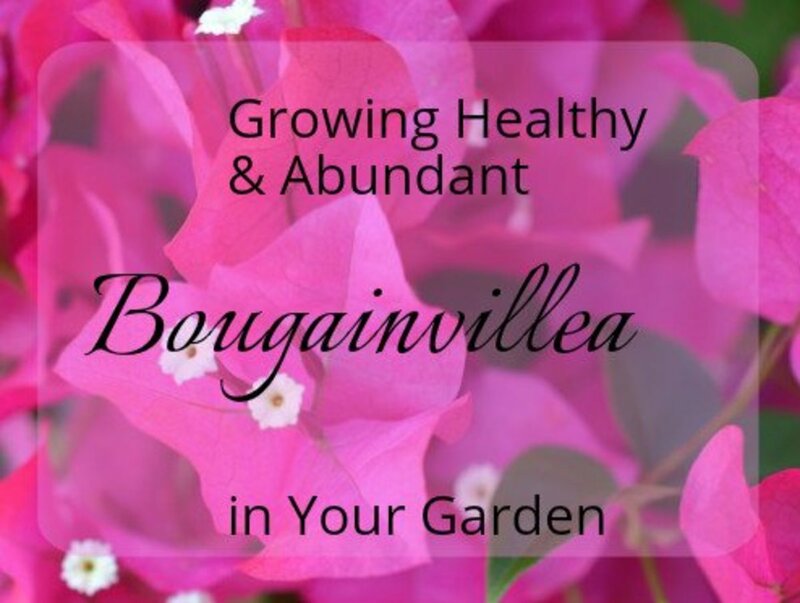 The mulch will help keep the soil cool and damp. 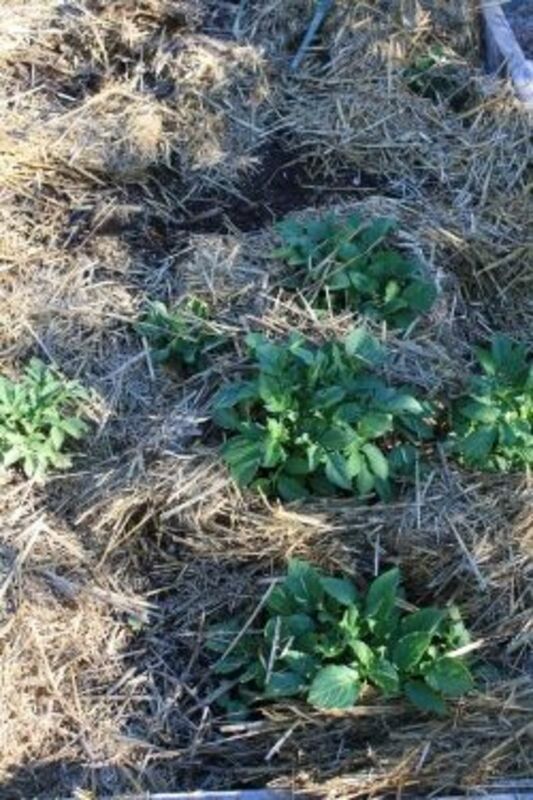 The mulch will also help keep the light off of any potatoes that grow through the soil surface. This is important because the light will cause the potato to turn green. Green potatoes (and any green part of the plant) contains a poison called solanine. If only the potato skin is green, you can make it safe to eat by carefully peeling all green parts away. You should always cut out any bit of sprout from the eyes. While a small dose of solanine may have no effect, a large dose can make you very sick or even kill you. Common symptoms include nausea, vomiting, diarrhea and stomach cramps. Most of the potatoes have sprouted so I've added some old straw as a mulch to help keep the soil cooler and retard evaporation. The potatoes are standing tall, especially the bakers that you see on the left in the photo. (The red and purples are on the right) All other things being equal, size of the plant and days to maturity are basically genetic traits that you really can't do much about. I have used up the dab of old straw I had for mulching and hadn't gotten a chance to buy more. We had a torrential rain on the 4th of July which washed a lot of silt and desert oak leaves down onto my sidewalk and patio. So I've been scooping it up and mulching the potatoes with it. As your potatoes grow you need to put on some mulch or at least 'hill' them up. 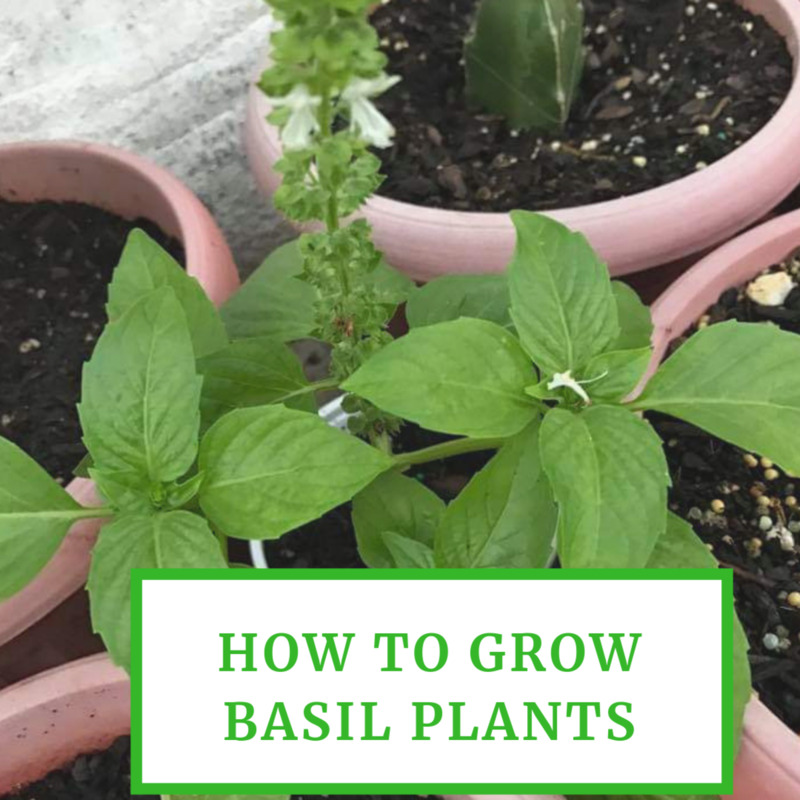 That is, if you plant in rows with some space between them, then you scrape up the dirt from between the rows and pile it around the stems of the plants. This helps keep them from flopping around and getting broken in storms. It also means that if your plants make potatoes close to the surface, you have covered them up so they will not turn green or get a sunburn. Well the sad news is that I went on vacation at a crucial point in the potato plants development and the neighbor that was watering the garden didn't realize how much water the potato plants needed when it was 100 degrees. Needless to say most of them were in sad shape when I got home. I pulled them out, harvested about half a pound of tiny little potatoes and planted lettuce for the winter garden. Check back next spring; I'll be planting potatoes again. In the meantime you might want to browse my other organic gardening lenses listed at the bottom of this page. Happy growing! Potatoes originated high in the Andes mountains of Peru, growing at elevations of up to 15,000 feet. Probably domesticated about 7000 years ago it spread throughout South America. Today potatoes remain a staple crop of many indigenous peoples living at high altitudes in South America. Potatoes were brought to Europe after the Spaniards arrival in South America. The first written record of the potato in Europe was in Gerard's Herbal, written in 1597. Potatoes were slow to catch on as a food crop in Europe at first. With time however, more and more lower class folks became dependent on them. This was because they would grow in a cool climate in which a grain crop might not ripen reliably as well as the fact that as a staple foodstuff providing protein and calories potatoes feed more people per acre than grain or meat. Due to destruction of the Irish countryside during it's war with England, the Irish people became dependent on the potato for their daily food. Unfortunately when the Spaniards introduced potatoes to Europe they only brought a handful of varieties. These varieties were susceptible to a disease known as Late Blight, caused by the fungus, Phytophthora infestans. Because all the poor of Ireland were growing large amounts of potatoes, all basically the same varieties, the blight swept through the land like wild fire. The result was about one million people starved to death and about another million left the country. World wide there are thousands of varieties of potatoes, including wild ones still growing in the Andes. Some varieties grow better under different conditions. Others have different cooking properties, some are better for baking, some for boiling or frying. Your local agricultural extension office should have information on the best varieties for your area. Even if you are not a gardener, take a moment and say 'hi'! Knowing that others are reading my efforts helps keep me going! Thank you Raymond! have all the same critter issues except I rarely have moles. So mostly rabbits, pack rats, squirrels and javalina. I will check out your website when I have a few minutes. Thank you for commenting! Mary, I live in AZ at 3751' elevation and our "soil" is almost pure caliche. I went to raised beds to solve that problem and it has worked out pretty decent for me. 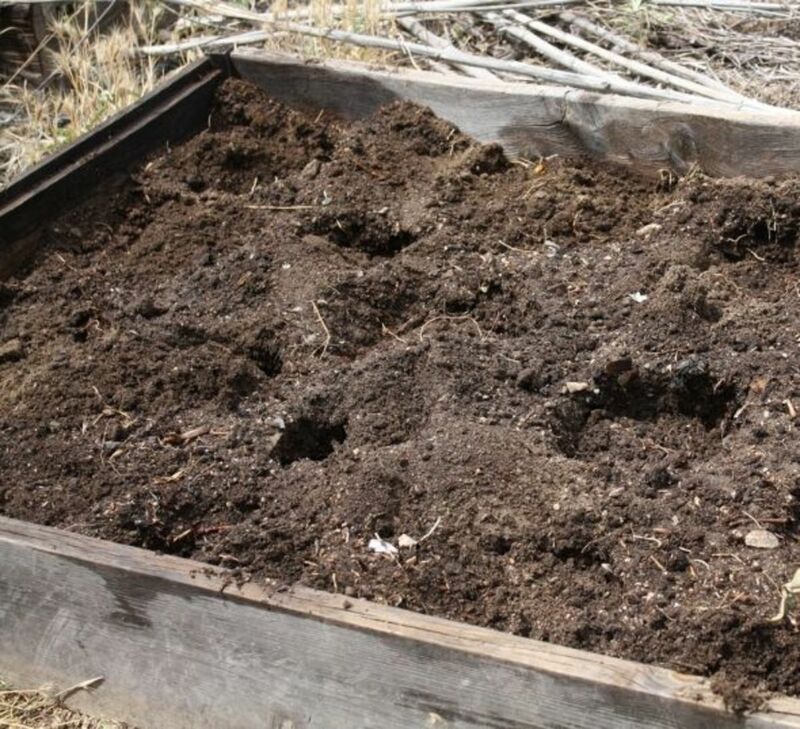 the problem is I have to keep up with composting so I can keep my raised beds full of soil. I like your idea of simply toughing it out and chopping down into the ground to form bed but in my area I'd have to line the garden pit with multiple layer of 1" chicken wire to keep burrowing rodents out. My raised beds are surrounded by three foot tall chicken wire fencing to keep rabbits out. I've built hoop houses over the beds and have to put bird netting over that to keep quail and ground squirrels out. I'd still have to do all that even if I dug new garden beds. I invite you to visit my website and check out my archived newsletters (as well as my books). I think you might find them interesting. I have a small veg garden in a paver edged bed. It is lower inside the bed, so not exactly raised. I have filled it with local soil, homemade mulch and store bought garden soil and aged manure. I grow 7 varieties of tomatoes, green and yellow beans. Red potatoes, squashes, cukes, wayermelon, yellow and orange bell peppers. Because I keep the soil up, it is a very intensively planted garden. I have drip lines throughout to water. Thanks for your articles. They are very informative. Hi, what type of potato do you use? what happened in the next year? Fascinating read - love it! Blessed! Excellent information and photos. I grow potatoes in huge plastic buckets. *Squid Angel Blessed* and I've added your link to My Squid Angel Wings to be featured in the " Home &amp; Garden Â» Gardening " neighborhood. You really know your potatoes. I like growing my own vegetables when I can. Lots of good information here - I never have much luck with potatoes, and only seem to get a handful from my plants - not very cost-effective, as the compost alone costs more than the value of the potatoes themselves, never mind the work and watering involved! Wow- what an informative lens, love the write ups and pictures for how to grow potatoes in the desert. Hey great job, I have not had a chance to grow potatoes yet but something I definitely want to do in the future! I enjoy this lesson on how to grow potatoes in the desert, something I hadn't contemplated before. They look wonderful. Nice steps for growing potatoes. My daughter in Tucson grows them and has good luck. I grew carrots, onions, and tomatoes this year in Florida. They've given up to the heat and strong sun now but I had a great crop earlier. Maybe potatoes next year. @Fcuk Hub: Thanks for stopping by, glad you enjoyed it. where did you live? @GonnaFly: Thank you and very much appreciated! It's winter here in Australia, so I will just have to keep an eye on the progress of YOUR potatoes :-) Blessed and added to my growing vegetables and herbs lens. HI! Love the article. For two years I've been growing potatoes in containers for my first potato growing, trying to experiment, but end up with minimal results. Next year I'll be growing them in the ground and will apply the techniques you have suggested, so thank you :) We eat a lot of potatoes and it would be wonderful to be able to grow them enmass. @chezchazz: LoL! Glad you enjoyed it! @Helene-Malmsio: Yummy! I didn't garden much last year or earlier this spring so I am missing eating the last of the snap peas with the first little new potatoes...one of my favorite spring dishes! @Diana Wenzel: Thank you for stopping by; potatoes are so easy once you find the right timing and have decent soil to work with. Of course I still don't get the yields I did in East TX on a sandy acidic soil. @nolinel lm: Thank you for stopping by; I'll be doing one on growing potatoes in pots soon; you could have a few on the balcony! @Clipart: Thanks for stopping by! Yes, much of the stuff written for other parts of the country make no sense here in the desert. Just about to plant my seed potatoes this afternoon. Seems like you read my mind. Perfect timing! Thank you. Right now I have a big bucket of home grown potatoes sitting in the kitchen waiting to be cleaned and stored - YUM - nothing tastes as good as home grown veges and fruit! I appreciated your advice since I also live in a desert region (high desert in my case). Moisture is a challenge for me. My grandmother always grew potatoes. I'd like to keep the family tradition going. Thanks for the tips. Very helpful. Wonderful gardening advice. I'm so pleased to see some other gardeners in the great Southwest desert where our seasons and soil and water supplies are a bit different. Thanks for this useful lens!